The Kel McNaughton Mk8 Centre Saver system enables the production of multiple bowls from individual blanks. The entire saver system comprises five configurations: large, standard, small, micro and a combined set of curved and straight blades that allow variable bowl profiles. The thickness of each bowl wall can also vary, depending on the turner's wishes. 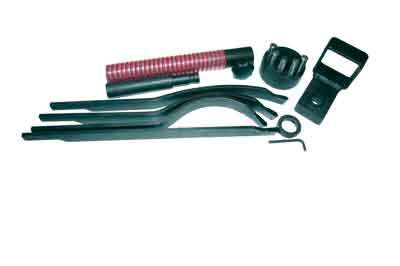 The five configurations available each include a pin gate, yoke, toolpost, handle and a selection of blades. The new Mk8 features a new toolpost - various sizes of stem size are available - a guide yoke assembly with extended functionality as well as a hollowing gate. There are now two sizes of gate assembly and four sizes of blades, which gives the system even more flexibility. The instructions are also extremely comprehensive. The blades do need to be maintained and this involves keeping them clean and sharp. I use abrasive paper and a spray intended to keep bandsaw blades free of sap, etc. Used together, they keep the blades free of any residue. The blade tip can be sharpened - but only if absolutely necessary - carefully on a bench grinder but is mainly maintained by a few wipes with a diamond hone. Saving several bowls from the centre of a blank saves money and allows the maximum use to be made of ever more expensive wood, and can, depending on blank size and blade selected, allow the creation of nesting bowls - bowls that stack inside each other. You can produce at least three bowl blanks from a 100mm-deep blank, depending upon the wall thickness required and blade selected. Advanced McNaughton tool techniques are capable of producing significantly higher numbers of saved bowls per blank. Unlike other similar systems that can only cut regular hemisphere curves, this system can, through a combination of different blades and operator skill, cut irregular curves and works on both side and end grain projects. The blades cut like a parting tool and put a lot of stress on the blades, toolrest and lathe itself. The blanks need to be well mounted and the lathe, in my opinion, at least 1hp and preferably more. The larger blade sizes may well need a larger motor size for maximum efficiency. I picked out a 350 x 120mm piece of dry - 11% moisture - yew (Taxus baccata) that had been around for several years. This was first mounted on a 20mm screw chuck, supported by the tailstock and trued up on both the front surface and circumference. Start with truing up the blank, then mount the shaped piece on a chuck in a recess or spigot - both need to be wide so as not to create a weak point to shear across when coring out. The toolpost was fitted into the lathe toolrest holder. The three parts of the toolpost need to be assembled, then the reduced diameter of the column top is inserted into the underneath of the support base. The protruding section of the column is inserted into the bottom of the pin turret and the side set screw is wound into the turret so that it enters the groove on the centre column, but doesn't lock up on it. The turret and support base can now rotate freely on the column. The tip of the tool should be set at the lathe's centre height and the post locked securely onto the banjo. It's worth mentioning again that the blank needs to be held securely on sound wood as the forces involved may be considerable. The front of the blade is fitted into the appropriate slot and under the gateway bar as this is designed to manage the stresses and vibration that the tool produces when in use. Bring the front of the gate as close as possible to the front of the blank and, after checking for free rotation of the blank, lock up the toolrest and banjo. The blade gateway is free to rotate as the blade is fed into the blank and the set screw and height setting collar allow the blade to be moved as required. The gateway at the rear maintains the blade's cutting height. There are several different approaches to determining the blade's travel and establishing the final depth of the cut. I set the cutting tip of the blade at the front of the blank to determine the starting wall thickness. I then looked from above at the curve of the blade and tried to move the blade to the position that matched the exterior curve and depth of the required bowl and then locked the banjo into position. Providing that the required bowl curve and the blade curve match, you should achieve the required wall thickness and bowl depth. With the lathe rotating slowly - around 600/800rpm but of course this is dictated by the blank size and its condition - the cut began and I cut the smallest bowl from the centre of the blank without any issues. When I got down to a diameter of around 25mm I put a screwdriver into the cut and broke off the core. You need to decide how you intend to mount the cored bowls for future work. 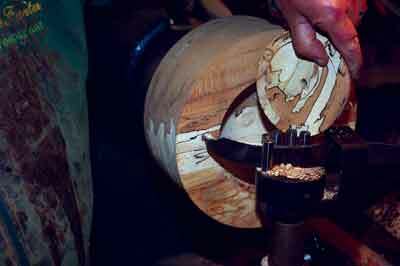 In my experience, there are several methods available; I normally use one of the following three options: first, cutting a recess on the inside of the bowl before coring it out, to enable expansion jaws to grip the inside of the bowl while turning a spigot onto the outside base; second, reversing the cored bowl into the curved recess left behind when it was removed and after bringing the tailstock up with a ring centre fitted - to avoid possibly splitting the blank â€“ turn a spigot to enable subsequent mounting; the third method is to simply reverse the cored bowl onto either a vacuum chuck cup or onto a suitably shaped mandrel covered with router mat and again, held in place with a ring centre in the tailstock. With the first core removed, I took a pass over the inside curve with a bowl gouge and tidied up the cut and curve left by the Saver blade. I also cut a small recess in the inside wall in order to be able to mount the bowl subsequently. I then set up the blade and toolpost for the second cut in the yew blank, having observed the procedure above, I thought, and started to cut the second core. It's worth mentioning here that the blade tip is always in line with the handle so it is possible to make an estimate of the position of the blade tip while the cut is in motion, even though it can't actually be seen within the blank. Having stopped the lathe and removed the blade a couple of times to allow the shavings to free themselves, I became concerned that my enthusiasm exceeded my skill and I may be cutting too deeply. The cut needed to be widened slightly as the blade started binding. A few moments later and I found I was right and the second bowl popped free, which left a clear view of the chuck jaws! Bowl three will make a mirror frame. A laser guide is available which, when fitted to the blade, shows exactly where the tool tip is positioned within the blank. It may be a useful addition to the kit. The second timber used was a piece of spalted beech (Fagus sylvatica). The blank measured 250 x 100mm, it was dry - 12% moisture - and was prepared in the same way as the yew. When mounted on the chuck jaws the Centre Saver was again set up in the same manner and positioned for the first cut. I took more time checking the alignment and potential blade path this time. The first bowl broke out exactly as planned and the process was repeated for the second cut - again I took greater care to try to anticipate the blade's path through the blank. This time things went well and a second core was produced pretty much as intended. The blade handle needs to be continually pushed upwards against the gate while cutting to maintain the cutting tip on the centreline of the blank. Allowing the blade to move around may cause a dig in that can be quite ferocious. Please do not forget the safety aspects of turning: always wear eye protection - a visor is ideal - and don't forget dust protection. Keep the tool sharp and the working area clean and tidy. Check that all adjustments are tightened securely, which will help to maintain the tool's position and prevent any unwelcome surprises. And last but not least, wear suitable footwear - having potentially large heavy blanks dropped onto the feet could cause a serious accident. I must in fairness declare that I have owned and used the previous model McNaughton Centre Saver intermittently for several years now and I am a fan. There was nothing in this remodelled kit that would cause me to change that view. The parts, as usual for McNaughton, possibly overengineered, are heavily made, well finished, relatively easy to use with practice and should last several lifetimes. The system is sold as either sets of comparable sized blades or as individual components so that the buyer purchases only as many or as few as they need. Many turners may only initially require one size set of blade as they may feel, for example, that only large blanks are suitable for using the tool on. I also felt that way initially but over time have also bought a set of the micro blades and a couple of the mid-sized blades as well. The blades offer considerable overlap due to their shape and size and it may not be necessary to purchase full sets. The handle supplied with the Standard Centre Saver tested is, in my opinion, too small at 250mm in length and doesn't provide the stability required to use the tool confidently. On buying the system, I would expect most turners to need a longer handle. That said, I understand that the current smaller handle is supplied after customers complained that the previous larger handle was too heavy. As wood blanks continue to increase in price - leaving aside all the potential arguments regarding our responsibility to conserve our timber and the exploitation of the worldâ€™s natural resources - the use of a coring tool to maximise the potential of each blank arguably becomes more attractive. The additional bowls saved are in effect free and it would not take too many blanks to recover the cost of the tool. There are many woodturning clubs around that provide book and video/DVD libraries, timber/consumable sales as a service to members - could this tool be bought as a club asset and make a contribution to all the members' timber costs? I would suggest the viewing of one of the videos/DVDs produced to demonstrate the Coring System in use as a picture does paint a thousand words. Seeing the system demonstrated would shorten the learning curve considerably. In writing this review some of the text was based on the published work of American turner Steve Russell. I would wholeheartedly recommend a review of this site by any users of the system as, in my opinion, it provides the most comprehensive, expert, detailed practical guidance available anywhere. The comprehensive guidance provided in the manufacturer's instructions were also invaluable in expressing my thoughts.